The New Age Movement is not and was never merely impoverished hippies dancing in the streets of San Francisco. Wealthy people enticed into its orbit have endowed it with extreme wealth. The Fetzer Institute, the John C. Fetzer Memorial Trust, The Tides Foundation, the Threshold Foundation, the Temple Foundation, the Three Swallows Foundation of Paul and Diane Temple, to name but a few. One of my blogspot contributors contributed valuable information some time ago about an informal group of New Age "philanthropists" known as "The Doughnut." 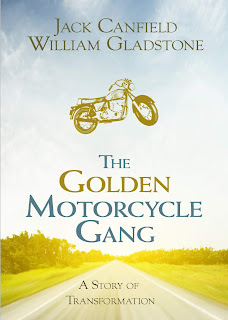 I have recently finished reading Jack Canfield's account of his group delusions of being a "golden motorcycle gang" reincarnated in the World War II era to bring "transformational change." The book suggests author Jack Canfield of Chicken Soup for the Soul fame together with a group of other successful New Age authors and leaders chose to come to Earth for our time. They came to become leaders if not "Ascended Masters"to save the Planet as :co-evolutionists" to help launch their so-called "New Age." They hoped their "blessed event" of ascendancy would take place in 2012. That was 30 years past their other hoped for event of New Age ascendancy of 1982, the year their New Age magazines were then proclaiming "Expect the Christ in the Spring of 1982." One of that "Golden Motorcycle Gang" was Barbara Marx Hubbard." Her "Planetary Smile" for 2012 was part of their scenario. What makes one cynically smile is the Jack Canfield, Barbara Marx Hubbard, and company's ridicule and smug contempe for "fundamentalism" when they believe things like that! Likewise with John E. Fetzer and his belief in "channelings", "devas", and the like. The Doughnuts: In 1981, Joshua Mailman convened a secret meeting in Estes Park Colorado, bringing together a semi-mystical New Age group of 22 wealthy young heirs who called themselves "The Doughnuts." They named themselves after a circular cloud that appeared over the meditation circle they had formed in their outdoor council, where they contemplated "the sacredness of the earth as a living organism" and their duty to save it and its indigenous peoples through joint use of their inherited wealth. The mystical circle became the permanent symbol of their spiritual origins and, in artsy stylization, remains the logo of the present, more secular, Threshold Foundation. In early 1982 Mailman co-opted the Threshold Foundation name and funding away from the London institution for the use of his informal organization of wealthy "Doughnuts." Each "Doughnut" was sworn to absolute secrecy about their commitment to lofty quasi-religious goals, the projects they funded, and their personal identities. Their internal newsletters used only first names and initials for last names. The projects they funded, like their gatherings, were typically the self-indulgent, romanticized, and quixotic acts of youth and unearned wealth. Gatherings: They held retreats and journeys in the Arkansas Ozarks; at Paradise Island (Nassau, Bahamas); Mount Sinai, Egypt, to watch the sunrise; "Green Gulch Community" for its "serenity of cosmic consciousness" in Marin County, California; Esalen on the Big Sur cliffside for personal transformation; the Yoga Center Fire Walking Ceremony at Area - a hot New York club. Early Projects: Several Doughnuts bought an "eco-lodge" in the Amazon jungle of eastern Ecuador; the entire group attempted to buy a gypsum mine in Arkansas to provide crystals to encircle the U.S. White House and Moscow's Kremlin in a magical crystal peace spell; one Doughnut (Harriet Crosby, General Mills money) founded the Institute for Soviet-American Relations in 1983 to prevent World War III; Richard Perl (his father was a wealthy New Jersey entrepreneur), who was still in Columbia Law School (with a business card saying "Peace Entrepreneur"), would become CEO of Deepak Chopra's holistic health corporation, Infinite Possibilities International and follow Mailman into founding the Social Venture Network. In the course of evolution , humanity has experienced several existential crises, which ultimately resulted in a transformation of the general level of consciousness after a period of disruption . Daily news these awful days suggest nothing short of a "period of disruption." Chaos has been a major element of the New Age game. The years of my life have doubled since this group was organized by Joshua Mailman<2> in 1981 -- the year I personally discovered and started reporting on the New Age Movement. 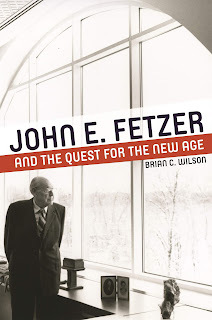 We may have slowed their agenda down that long -- those promoting the Maitreya the Christ crusade that clearly intended Fetzer Institute creator John E. Fetzer. Brian Wilson's book that is enthusiastically promoted by those preserving Fetzer's legacy makes that abundantly clear.<1> He may well have been part of the funding for the half-million dollar ad campaign that ran banner size full page newspaper ads on April 25, 1982 proclaiming "The Christ is Now Here." He was not the only one with money. According to another much earlier (1997) book on the life of John C. Fetzer, JOHN FETZER: ON A HANDSHAKE by Dan Ewald, Fetzer pursued his obsession "to his dying breath." (page 10) Very, very sad! This is a copy of the full page newspaper ad that ran worldwide in major papers of the world on April 25, 1982. 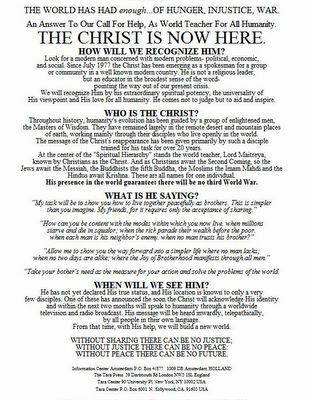 When the ads ran they were projecting that their "Day of Declaration" (revealing of their new "Christ" would come within the next two months of the ad. They have had a slight delay, but they have never said it didn't work out -- only that "he" is still awaiting the right time and acceptance. I have much more to say -- the Fetzer book is not a mere history of an interesting quirky but wealthy person. I believe it is a type of literary and "civil society" coming out party that intends to make the New Age the very "Now Age" Examining the 990 reports of these networking institutions it is apparent they have vast sums of money at their disposal -- the type of money that buys media support. There are now claims and studies claiming a majority of USA residents now have New Age beliefs. 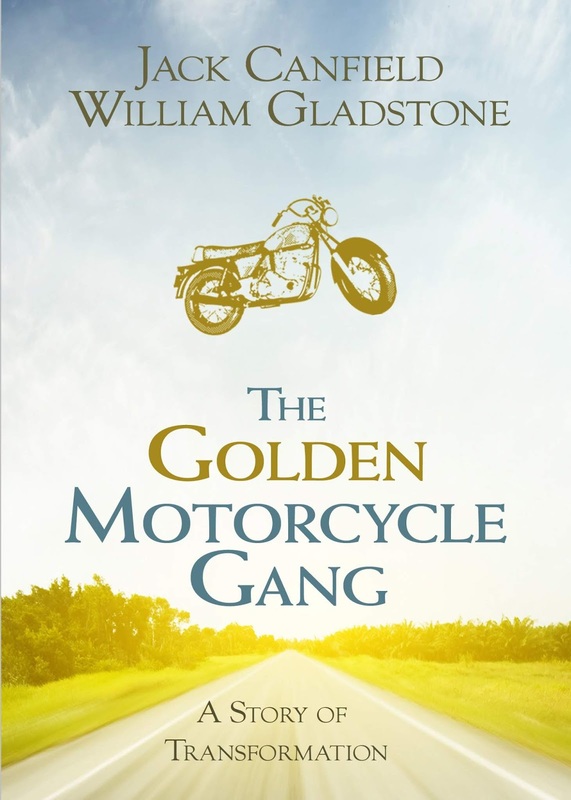 Well, their "Golden Motorcycle gangs" appear to be riding. I doubt if they make it to the biblical Streets of Gold! I will be writing much more. Please make your inputs here as well. Many thanks to the 2016 contributor who anonymously posted the Joshua Mailman and "doughnut" group information. And, yes, chaos sufficient to bring down the USA is still very much part of the New Age agenda as it was when I first discovered their doings back in 1981. The difference now is that many have gone back to sleep, apathy again rules the day, and technology has advanced sufficiently to enable them. I will present summaries of the wealth of some of these organizations (Fetzer Institute, Institute of Noetic Sciences, Tide Foundation, Center for Conscious Evolution) in my next posting. <2> Joshua Mailman was and is a considerable force both in New Age and in economic circles. This is from the Bloomberg website: Mr. Joshua A. Mailman, also known as Josh, serves as President at Sirius Business Corporation. He serves as a Managing Director at Sirius Change Investments. He is also Managing Director at Serious Change L.P. Mr. Mailman serves as an Investor and Senior Advisor at Impact America Fund. He serves as a Partner at The Social Entrepreneurs' Fund. Mr. Mailman founded Social Venture Network in 1987, Business for Social Responsibility in 1992 and Threshold Foundation in 1981. Mr. Mailman serves as an Advisor of Everyone Counts, Inc. and Catchafire, IncHe served as Vice President of Sales & Marketing and Business Development at Everyone.net, Inc. Mr. Mailman was responsible for the marketing efforts and continued growth of Everyone.net services. He served as Vice President of Operations at eFax.com Inc. since August 1999 and Product Manager from May 1992 to June 1993. Mr. Mailman served as Vice President of Messaging and Communities at NBCi, where he oversaw the email.com relationship. From July 1993 to January 1997, he served with Xerox Corporation in a variety of positions, lastly as Director of Worldwide Marketing Operations for their workgroup fax product line. Mr. Mailman had the opportunity as President at the Multifunction Product Association (MFPA) and on the customer advisory board of Mercury Interactive. He is founding trustee of SRT, UK and initiator of Synergos Middle East Social Innovators Program. Mr. Mailman serves as a Director of ABC Carpet & Home, Inc. He serves as a Member of Board of Advisors at Mission Research, Inc. He has been a Non-Executive Director of Napo Pharmaceuticals, Inc. since 2015. He serves as a Director of Liberty & Justice Inc. He serves as a Member of Advisory Board at Conscious Enlightenment, Inc., and LeapFrog Investments. He serves on the boards of the following organizations: Museum for African Art, Culture Project, Women Moving Millions, PathBrite, Alter Eco, Icon Wheelchair, General Compression, Ronny Brook Distribution, CatchaFire, Global Mojo, OriginalBeans, Human Rights Watch, Mailman School of Public Health at Columbia University, the Fund for Global Human Rights, Blacksmith Institute, Afropop Worldwide, Environmental Defenders Law Center, Witness, Chiliad Inc., Pride Diamonds and Bioresources International. He serves as a Board Observer at Mission Markets, Inc. He served as a Member of Board of Advisors of FTL Solar, LLC. Mr. Mailman has worked over a decade in the messaging industry. Mr. Mailman holds an M.B.A. in Marketing and Finance from the Anderson School of Management at UCLA and a B.A. in Economics from the University of California at Los Angeles. 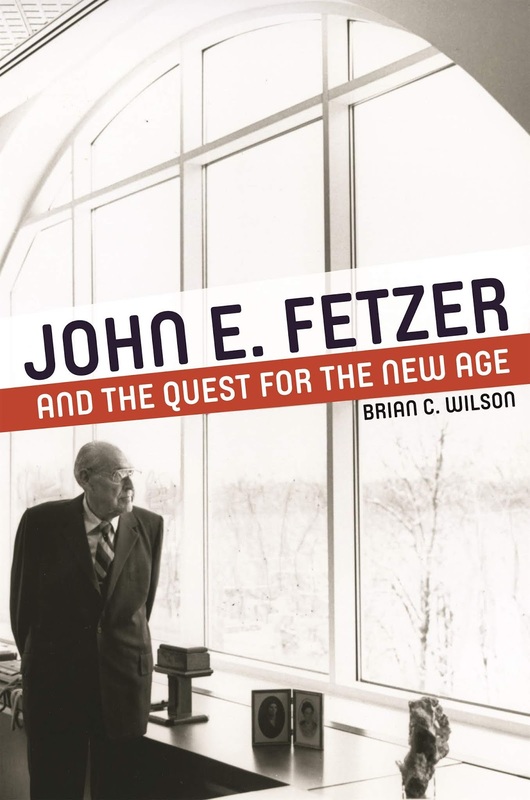 On December 31, 2018, the Detroit Free Press had a front page story and 3 inside pages nearly full or nearly full devoted to John E. Fetzer and the Quest for the New Age. That is also the title of the Brian Wilson book by that name. It is has lots of information about the New Age Movement, sadly proving the turth of what I wrote in Hidden Dangers of the Rainbow. Conveniently for the New Ager Movement, Wilson wittingly or unwittingly omitted information on the pre-world War II "I AM Movement" (per Wilson the Movement in which Fetzer had spent the most time and was the largest American Theosophical Movement). Wilson had to have known of the relationship between Guy Ballard and William Dudley Pelley and the interlocking nature of the I AM and the Silvershirts -- a pro-Nazi Movmenet that dangerously flourished int he USA prior to World War II. Pelley spent time in prison for those activities. The true nature of "New Age" is truly in the most literal sense of the word: "Anti-Christ"
Also conveniently missing from Wilson's book was any mention of the open and enthusiastic sympathy for Lucifer existing int he New Age Movement. The Theosophical Society;s official magazine in its early days was "LUCIFER". Wilsn spent much time discussing Alice Bailey and Fetzer's appreciation and promotion of the Lucis Trust work. I do not believe that Wilson did not know that organization was openly anti-Semitic in those Alice Bailey books and that it started its New York City life operating under the name "Lucifer Publishing Company." Despite the efforts of what I term "Disinformation Agents" infesting Christian circles, both Evangelical and Catholic, to convince you the New Age Movement has not targeted Christianity, it clearly has. I learned and documented this when I discovered the Movement and its ultimate goals. One of those obvious goals was a "New World Religion". New Age New Age: A Collection of Thought Systems New Age is a compilation of metaphysical, Eastern-influenced thought systems. These thought systems unite theology, nature, and philosophy. This movement comprises countless "theologies" that often center on religious tolerance and moral diversity. The main phrases (or "isms") that reveal the focal point of New Age thought are "feel-goodism" (do whatever feels good, as long as you are not hurting someone else), "moral relativism" (situational ethics), and "pluralism" (universal tolerance). 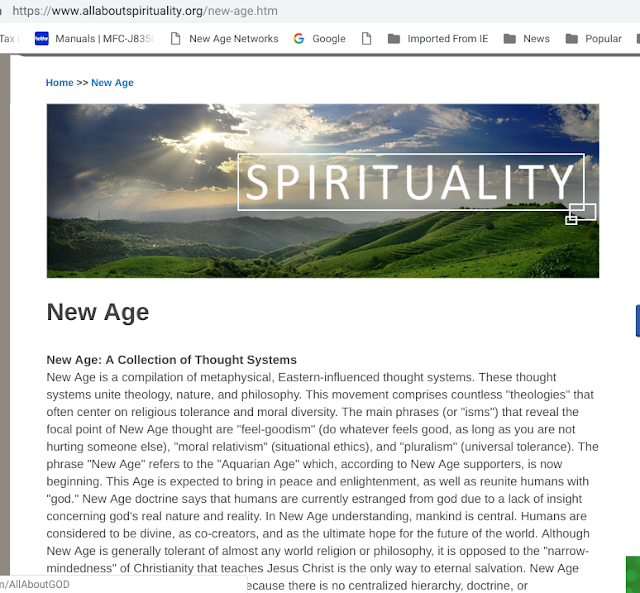 The phrase "New Age" refers to the "Aquarian Age" which, according to New Age supporters, is now beginning. This Age is expected to bring in peace and enlightenment, as well as reunite humans with "god." New Age doctrine says that humans are currently estranged from god due to a lack of insight concerning god's real nature and reality. In New Age understanding, mankind is central. Humans are considered to be divine, as co creators, and as the ultimate hope for the future of the world. Although New Age is generally tolerant of almost any world religion or philosophy, it is opposed to the "narrow-mindedness" of Christianity that teaches Jesus Christ is the only way to eternal salvation. New Age philosophy is complicated to define because there is no centralized hierarchy, doctrine, or membership. At its foundation, the New Age movement is a religious system with two main doctrines: Evolutionary Godhood and Global Unity. 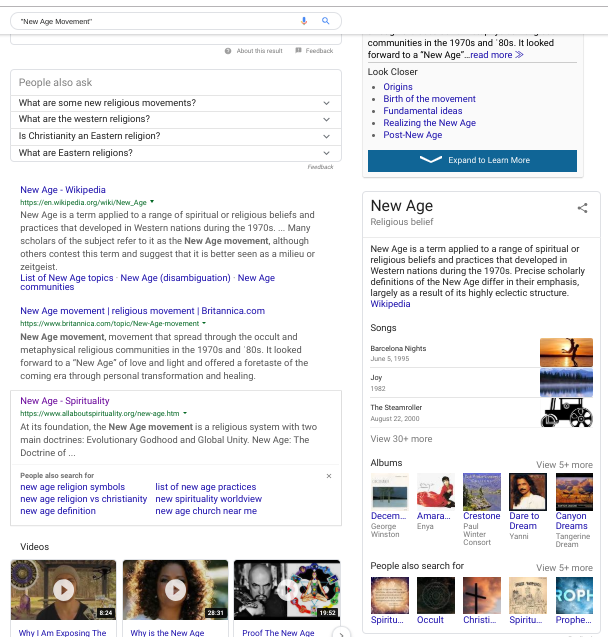 I direct your attention to the third search prioritized by Google as "New Age - Spirituality. New Age Messiah - global governance leader -- one they cheerfully admit is not Jesus. The Brian C. Wilson book has painfully awoken me to the hard fact that they are on the move again with the very same ugly agenda. We may have, with the help of God and disenchanted New Agers who rightfully fled the Movement, slowed them down a good 35 years. However, they are still on the march with many of the same soldiers still in the game as when I first discovered them: David Spangler, Barbara Marx Hubbard, Jack Canfield and his "Golden Motorcycle Gang" (Barbara Marx Hubbard and many others detailed in Canfield's book of that name, They still practice networking, but now much obvious organizing such as "Transformational Leadership Council", Institute of Noetic Sciences (IONS, the Fetzer Institute (institute to advance the New Age Movement and agenda globally), and so many others are out there. As New Age / Environmental writer Paul Hawken bragged, their Movenebt -- one he claims nobody saw coming, but I and many other saw it coming and tried to warn over the years over the representations to the Christian community of those claiming to be "Counter-Cultists) that it did not exist and that the New Agers were not polirtically networked in any way. That was one audacious statement Walter Martin made to what was supposed to be the first major Evangelical conference against the New Age Movement held at the Denver Seminary in March, 1985. New Age apologist, cult protector J. Gordon Melton spoke at that conference by the organizer's invitation. His title? "A Christian Response to the Hidden Dangers." The Fetzer Institute is a major New Age player. It is well endowed with many millions of John E. Fetzer's fortune. It is not alone. Paul N. Temple (co-founder of the Institute of Noetic Sciences and its chief financial backer) has died and undoubtedly left much of his fortune to that cause. The founder of hte Templeton Foundation has died, but his fortune has gone in similar directions. Yes, that Movement is on the move. Its strong alliances with the LGBTQ and other hostile to Christian and other forms of monotheism make it this time formidable indeed. And, now it appears that apathy has settled in as they once again march vigorously to our detriment with the help of their aging but angry forces now longer in the teeth upset that they did not take over long ago as they thought would happen in 1982 before they were unexpectedly outed. Yes, it is time to wake up. They New Age Movement never went away. It did some regrouping and shape shifting but now it appears they are proudly flying their flags. Yes, they still call it 'NEW AGE! I'm reading both the Kindle and hard copy editions of an astounding new book about the life of the former Detroit Tigers owner John E. Fetzer (1901-1991). Reading that book is almost like reading a mirror image opposite of my 1983 book THE HIDDEN DANGERS OF THE RAINBOW: THE NEW AGE MOVEMENT AND OUR COMING AGE OF BARBARISM. "He shall honor in his estate the god of forces, a god whom his people knew not." Also, somebody failed to ask him which part of "thou shalt have no other gods before me" did he not understand Further, his religious education should have had greater emphasis on Deuteronomy chapter 18 which contains a list of spiritual practices forbidden to the Jews as the reason why God was removing the previous occupants from the lands he was giving them. Virtually every one of those forbidden practices was adopted by Mr. Fetzer. That is very sad! Perhaps all here need to know that Lucis Press had an earlier name and I have three books in my personal library that prove it: "Lucifer Publishing Company." There was a profile in 2d Thessalonians, chapter 2 as to who was and who was not taken in by the anti-Christ: "the love of the truth." None of us probably have perfect truth. We all see through glass darkly. BUT, we must cherish and protect the words God gave us through his word, unfashionable as it now may seem. Mr. Fetzer was into Benjamin Creme, a "Course in Miracles," psychic readings, bowed down to Buddha (watch the video of Mr. Fetzer meditating -- the image of Buddha is before him as he does -- it is up on the Fetzer Institute's website and I have downloaded same). Mr. Fetzer should not take all the blame for this deception. The 7th Day Adventists who awarded him a 1980 honorary doctorate should take some -- evidently his generous contributions to Andrew University were more important to them than Mr. Fetzer's soul. The Presbyterian minister of his should take blame as well. Both could have done more for that man. as class valedictorian when it was then named "Emmanuel Missionary College".